A man lights a candle in front of the theater Le Bataclan in tribute to victims of the Nov. 13, 2015 terrorist attack in Paris at the Bataclan. With yet another terrorist attack overseas threatening China’s citizens, how will Beijing respond? A week after coordinated attacks in Paris left 130 dead, roughly a dozen gunmen stormed the Radisson Blu Hotel in Bamako, Mali, taking 170 people hostage. According to Chinese media, at least seven Chinese citizens were among the hostages. Details are scant on the still-breaking story – as of this writing, the BBC was reporting that Mali’s special force had entered the hotel to combat the attackers. It’s unclear who the gunmen are, or whether they are affiliated with any organized groups. Witnesses reported that the attackers were freeing prisoners who could recite the Shahada, an Islamic creed of faith, seeming to indicate that the attack was meant to target only non-Muslims. At least three people have been reportedly killed, with the situation still developing (and over 138 hostages believed to be still inside). Hong also emphasized that the Chinese government had tried to rescue Fan. “Relevant departments of the Chinese government activated emergency response mechanism upon learning the kidnapping and made all-out efforts to rescue him,” Hong said. Yet when it comes to both launching rescue missions in the Middle East and holding “the perpetrators accountable,” China’s capabilities remain limited. Writing for Reuters, Ben Blanchard explores just how constrained China’s options were. Beijing’s military experience abroad has grown in the past decade, but still remains mostly limited to peacekeeping and anti-piracy operations. China doesn’t even have a military base abroad to use for staging oversea operations. Sending military troops to try to track down and rescue Fan was simply not a realistic option for China – and it doesn’t even have the legal framework to do so at this point. As Blanchard points out, China has released a draft law that would authorize counterterrorism operations abroad, but the law hasn’t yet been passed. It’s interesting to compare China’s reaction to the response in Japan when two of its citizens were taken hostage and eventually murdered by ISIS in January 2015. Tokyo faced similar constraints on its ability to conduct rescue or even intelligence gathering operations in the Middle East. Yet, to date, the hostage incident has not significantly changed Japan’s approach to ISIS or the Middle East, which remains largely confined to offering humanitarian aid to civilians in areas wracked by violence. Beijing has been extremely reluctant to join in more open-ended military operations against ISIS, whether it’s the U.S.-led coalition of airstrikes or Russia’s joint efforts with the Assad regime in Syria. When asked on Friday if China would consider military action in Syria, Foreign Ministry spokesperson Hong Lei advocated instead for a political solution, saying that “violent means lead nowhere.” That hardly sounds like China is ready to ship its troops to the Middle East to battle ISIS – or anyone else for that matter. 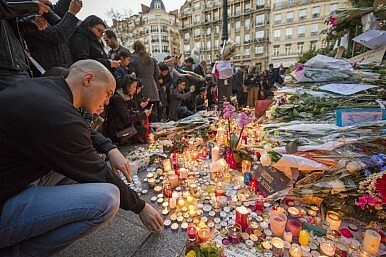 With three attacks within one week affecting Chinese citizens abroad – in addition to Fan’s murder and the Mali hostage-taking, a Chinese citizen was injured in the Paris attacks – China’s government will face pressure to reconsider its approach to international terrorism. The question now is how Beijing will respond. The government has already made clear it doesn’t want to follow the U.S. model of military intervention, after having watched disasters unfold in Afghanistan and Iraq. But China’s preferred method of addressing “the root causes” of terrorism through economic development have yet to bear fruit – either abroad or in China’s own Xinjiang province. Like the rest of the world, China is wrestling with the problem of how to best address terrorism – and finding there are no good answers.